← Congratulations Week June 17, 2013 & July 1, 2013 Giveaway Winners! Gosh, even way-way back in high school I knew I wanted to write. I majored in journalism and found the stories too restricting. My fingers itched to embellish and add depth and dimension. Needless to say, my hand was slapped a lot. 🙂 Life got busy and the writing took a back seat for years. Five years ago, my husband suggested I throw caution to the wind and go for it. I did! I write romantic suspense. The drama and danger combined with a healthy portion of internal conflict is great fun to write. Throw in a dab of intense passion, and I’m a happy writer. I want my stories to be realistic, so a lot of research goes into a book before I write the first sentences. I just finished a book set in Colombia! That racked up way over sixty pages of research. Did you know there’s a beautiful blue butterfly in the Amazon that is poisonous? Can I say typing the end? No? Then it’s after I write a scene where I’ve gotten out of my own way and let the characters take over. You know that moment when you read something and think, WOW, did I do that? It’s rewarding. But the most rewarding is when a reader likes my work. I had a reader email me that she felt as if I were writing just for her. Man, that brought tears to my eyes. Plotting. And if your readers could see me they’d have noticed that full body shiver. I try, really I do, to plot. Doesn’t work for me. So I develop my characters, give them a story idea, and see where they take me. Bad question! My friends and family will confirm that when I finish a book, I’m convinced I’ll never have another original idea. I’ll grouse, whine, and complain! I’ll pore over newspapers and read FBI profiler books. Then something will spark an idea and I’m creating again. I write in total silence. Coffee in the morning with our rescue dog in my lap. Hard to check email with him inspecting the keyboard, but he only weighs ten pounds so I work around him. I have to police myself or I’ll hang out on social media too much, because I enjoy chatting with readers and supporting other writers. But I log off and write for a few hours early in the morning. Then it’s scullery maid duties and meal time! Tough one! I sometime have to go back and layer in emotions. I’ll get caught up in the moment chasing serial killers and forget to plug in the internal thoughts and emotion. I try to catch them in rewrites. Someone To Watch Over Me, my short story, is brand new! Hell or High Water, Book One in The Lost and Found, Inc. series should release early August. 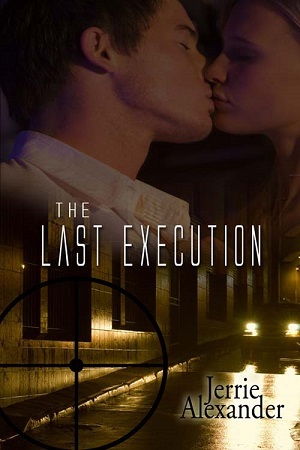 BE SURE TO COME BACK to read more about Jerrie and two of her novels, THE LAST EXECUTION and HELL or HIGH WATER, a *Double Feature* on Wednesday’s Karen’s Killer Book Bench!! Happy Reading! Good morning, Karen! Thank you for having me over today. 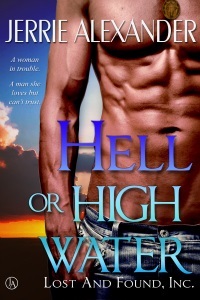 I’m trilled to announce Hell Or High Water released today! I’ll be around all day to chat with visitors. Good morning, Jerrie! Thanks for stopping in to visit with us today. Congratulations on your newest release!!! 🙂 I can’t wait to read it. I’m such a huge fan of your book, Jerrie! I just bought Someone To Watch Over Me and I can’t wait to read it today!! Much success to you and thank you for the incredible reads!! Barb! Thanks for stopping by! I hope you love the book! Karen, I truly appreciate your support! I hope you love the book. Bwahahahahahaha…..on question 5 I totally read it as “spank” an idea! I really respect people who follow their bliss and are able to put pen to paper (cause that’s how I imagine authors create) and create art. Congratulations, looking forward to your new series. Hey, Karen, Jerrie. Been slogging away on my blogging calendar and just popped up for air. You know I’m such a fan of your writing, Jerrrie. Everything is soul-grabbing, high energy, super story telling, with characters you’ll ache and root for. Real miffed I can’t get my hands on Hell or High Water yet. (I’m a Nook reader.) I know it will be every bit as great as your others! I really enjoyed The Last Execution. Looking forward to Hell or High Water. Good luck with them all. Living in the country does have it’s draw backs. I depend on wireless internet, but it’s back up! Yea!! Janet, LOL! But if I could “spank’ a good story idea out of myself, I might have to give it a try. Just a gentle smack! Kate and Marsha, thank you for your comments. I truly appreciate your support. Thanks, ladies for commenting. You rock!